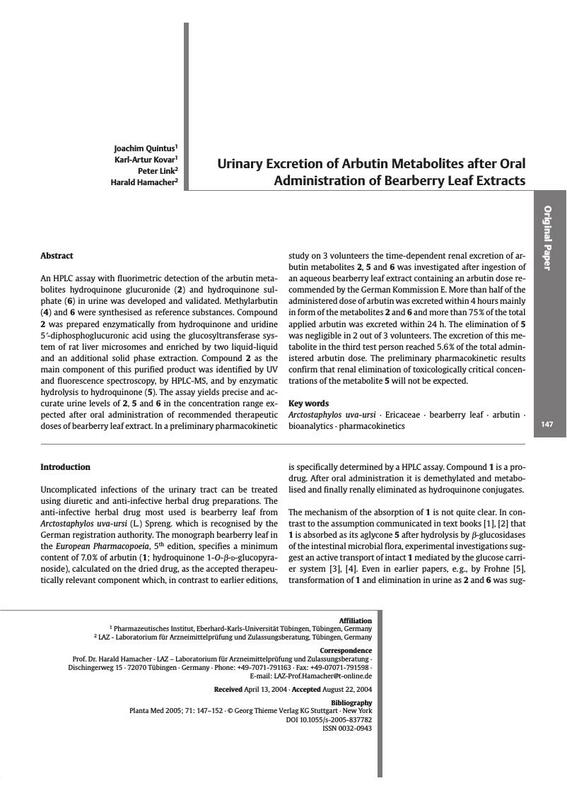 An HPLC assay with fluorimetric detection of the arbutin metabolites hydroquinone glucuronide (2) and hydroquinone sulphate (6) in urine was developed and validated. Methylarbutin (4) and 6 were synthesised as reference substances. Compound 2 was prepared enzymatically from hydroquinone and uridine 5′-diphosphoglucuronic acid using the glucosyltransferase system of rat liver microsomes and enriched by two liquid-liquid and an additional solid phase extraction. Compound 2 as the main component of this purified product was identified by UV and fluorescence spectroscopy, by HPLC-MS, and by enzymatic hydrolysis to hydroquinone (5). The assay yields precise and accurate urine levels of 2, 5 and 6 in the concentration range expected after oral administration of recommended therapeutic doses of bearberry leaf extract. In a preliminary pharmacokinetic study on 3 volunteers the time-dependent renal excretion of arbutin metabolites 2, 5 and 6 was investigated after ingestion of an aqueous bearberry leaf extract containing an arbutin dose recommended by the German Kommission E. More than half of the administered dose of arbutin was excreted within 4 hours mainly in form of the metabolites 2 and 6 and more than 75 % of the total applied arbutin was excreted within 24 h. The elimination of 5 was negligible in 2 out of 3 volunteers. The excretion of this metabolite in the third test person reached 5.6 % of the total administered arbutin dose. The preliminary pharmacokinetic results confirm that renal elimination of toxicologically critical concentrations of the metabolite 5 will not be expected.